All departments like Anatomy, Physiology, Bio-chemistry, Pathology, Pharmacology, Microbiology, Forensic medicine and Community medicine have been designed as per MCI norms. The Institute has state-of-the-art air conditioned lecture theatres that are designed spaciously to accommodate 250 students at a time. All the lecture theatres are facilitated with audio visual equipment including LCD projectors, slide projectors, microphones, etc. Apart from the lecture theatres all the departments have seminar/demonstration rooms with a seating capacity of 25 to 40 with audio-visual aids. Digital IP cameras are installed to record live lectures, which are converted into digital format for the provision of E-learning. Multi-purpose halls are designed for conducting internal and university exams. These halls are equipped with surveillance system to monitor the students during examination. A well established air- conditioned central library of 3200 sqm area, 400 seating capacity with books and journals( Indian and Foreign) as per MCI norms. 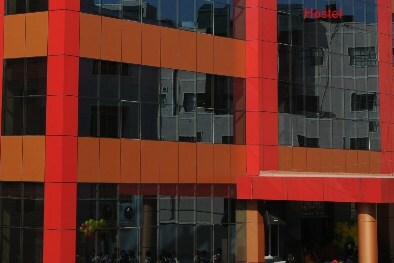 A fully equipped computer lab, internet facility and an eclusive room with audio-visual aids. Department animal house is maintained by the department of Pharmacology. In addition to the animal house, experimental work on animals is demonstrated by Computer Aided Education. The provides separate hostels for boys and girls with spacious, clean, and well-furnished living spaces and recreation rooms. The hostel mess serves hygienic and nutritious food in spacious dining rooms. Round-theclock security services ensure adequate safety to the inmates of the hostels. There is a dedicated committee consisting of wardens, assistant wardens and college manager—headed by the principal—to oversee hostel facilities, maintenance of discipline and address problems of the hostel inmates if any. A sophisticated health club and outdoor and indoor games facilities are available to keep the doctors-to-be physically fit.Students can indulge in sports such as football, basketball, cricket, hockey, etc. and indoor games like badminton and table tennis. A well-equipped air conditioned Gymnasium for both staff and students having a qualified physical instructor has been developed by the institute. Well-designed two bed room flats with all the basic and modern facilities are provided for Sr. Residents and Junior Residents. 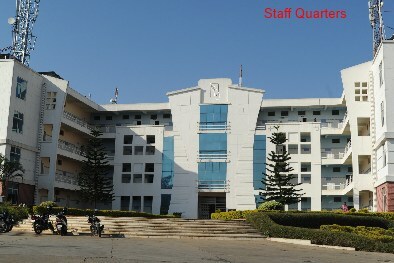 Quarters, with access to integrated common facilities like telephone, 24 hours power, continuous water supply, pure drinking water, etc., are also provided for teaching and non-teaching staff on priority basis. The Anti-Ragging Committee and the Anti-Ragging Squad are constituted to force immediately. The following are the members in respective committees. Hence all the staff members and students are requested to cooperate in totally preventing ragging. Staff and students are also requested to keep a watch on the student’s movement to prevent Ragging incidences and to report if any such incidences take place immediately to either committee member or the Nodal Officer. The institute arranges pick and drop facilities, from the main road junction to the college and hospital, every hour for staff, students, and patients and their caregivers. 24 hr tight security is available in the hospital, hostels, residential quarters and the college campus.